This is a free printable for you to be able to display in your home. I LOVE how perfectly this quote goes with my word of the year which is ENERGY and my goals for this month, which are all centered around work (more on that here). 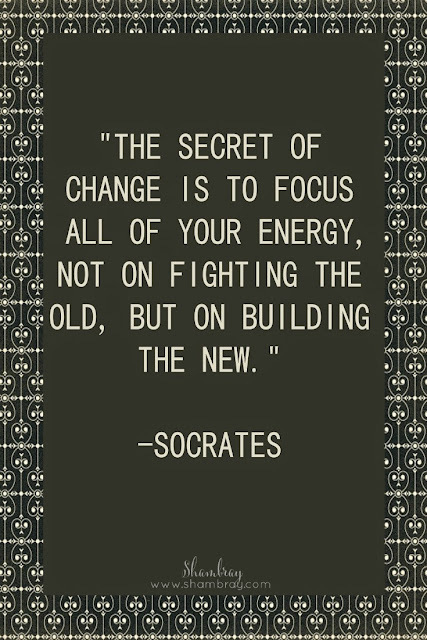 Socrates had it right. I love everything about this quote. How many of us fight the old? I know I do. I am so much better at this now than I was in the past, but I am still working on it every day. If you feel like you put way to much energy into the past and it is frustrating you...know that you are not alone, and that we work at it and change that now. I know I will focus on the past so much that it will physically give me a headache. Honestly, what good does focusing on the past do? It is terrible. I get that you can learn from the past, but dwelling on it or trying to fix the past is exhausting and really you cannot change it (big UNFORTUNATELY). However, we can build a very bright future for ourselves if we put our energy into that. I think how much more energy I would have if I would just stop panicking about the past and looking forward to the future. I could take what I learned and move forward. Therefore, making my future a better one. I could also show my daughter (by example) how to build a bright future. The first step is not fighting the past. So let's start building the new. Let's stop fighting the past. Let's make this month a great one by starting this today. I hope we can all see an increase in energy if we do this. Good luck and don't forget about the challenge I extended this month along with the giveaway! It's really great quote and the related writing.